Nate Doan’s generosity, kindness, and warmth were manifested for over 50 years in what many have called his true persona, Santa Claus. His dedication to the community of Bay City, Michigan is evidenced by his long role as Santa at Goddeyne’s Sporting Goods and Hardware Store from 1954 until the store closed in 1987. Doan, along with his wife Mary Ida, became an institution in the region as one of the first Mr. and Mrs. Santa Claus teams. Together they appeared at many civic and private Christmas events in Michigan and across the nation. Doan was a 1953 graduate of the Charles W. Howard Santa Claus School and would become the Dean of the School in 1966 after Howard’s death. 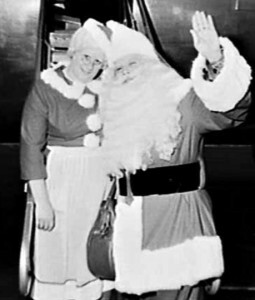 In 1967, Doan and his wife taught special Santa classes in Australia. In the early 1990s, the Doan’s founded the Santa Claus House in Bay City for the children of the area. Nate Doan’s Santa and community work was honored in the Congressional Record of the 103rd Congress.